Paley Type 5 TH is defined by a complete absence of the tibia. This is the biggest challenge for reconstruction because there is no knee joint. While ankle fusion gives good function with little disability, knee fusion leads to significant disability for sitting and climbing stairs. It is preferable to avoid a knee fusion. Even if active knee motion cannot be achieved, a mobile knee joint supported by a brace is preferable to a knee fusion. If a patella is present it can be converted to a tibial plateau. The original idea was first published by Dr. Michael Weber. The patella is moved from its normal position to the end of the femur. The fibula and patella are fused. 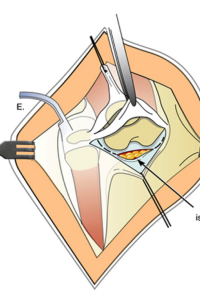 This procedure is referred to as the Weber patellar arthroplasty. The Weber procedure can be performed acutely, as described by Weber, with gradual correction of a flexion contracture of the knee joint, using a hinged external fixator. Dr. Paley prefers staged gradual distraction of the fibula to first correct the knee flexion contracture. Once the femur, fibula, and foot are all aligned, then the Weber procedure can be performed. The ankle is fused to the fibula in the method described in Type 4 TH. The first step of the Weber patellar arthroplasty is to expose the end of the fibula and femur. Next, the biceps tendon is lengthened and the peroneal nerve decompressed. 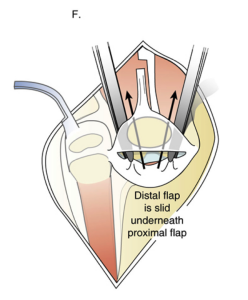 Two “visor” flaps are outlined with a marking pen, one proximal and one distal. 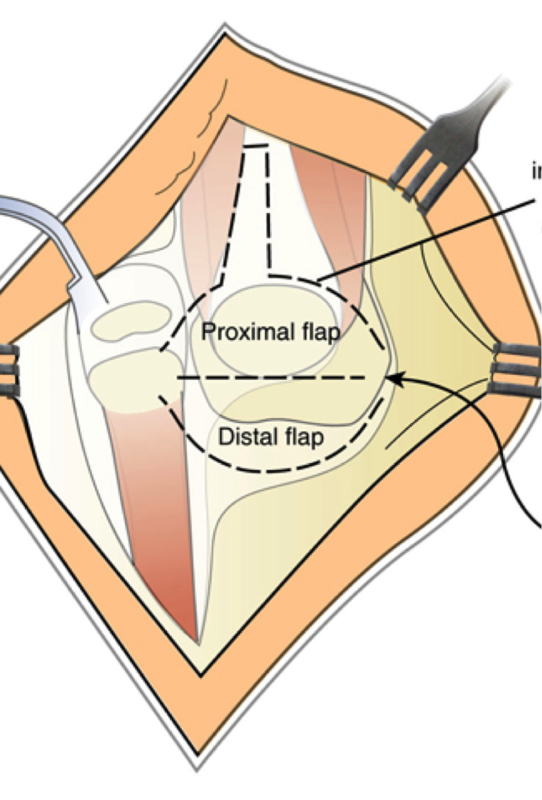 The proximal visor flap contains the patella and the distal visor flap is all capsular with a small part of cartilage. This cartilage will form the new patella. The visor flaps are incised and the posterior capsule is cut with great care so as not to damage the underlying structures. 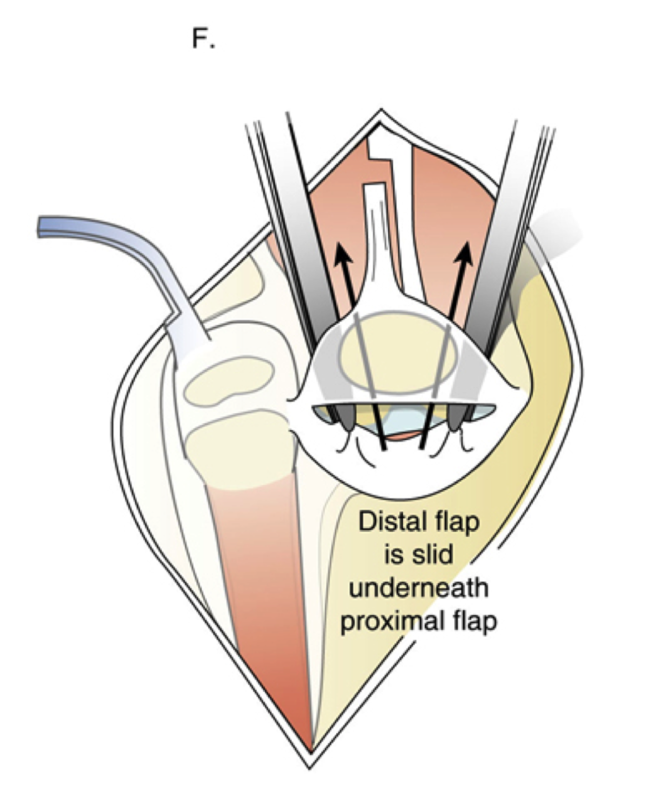 The distal flap is then carefully slid underneath the proximal flap. 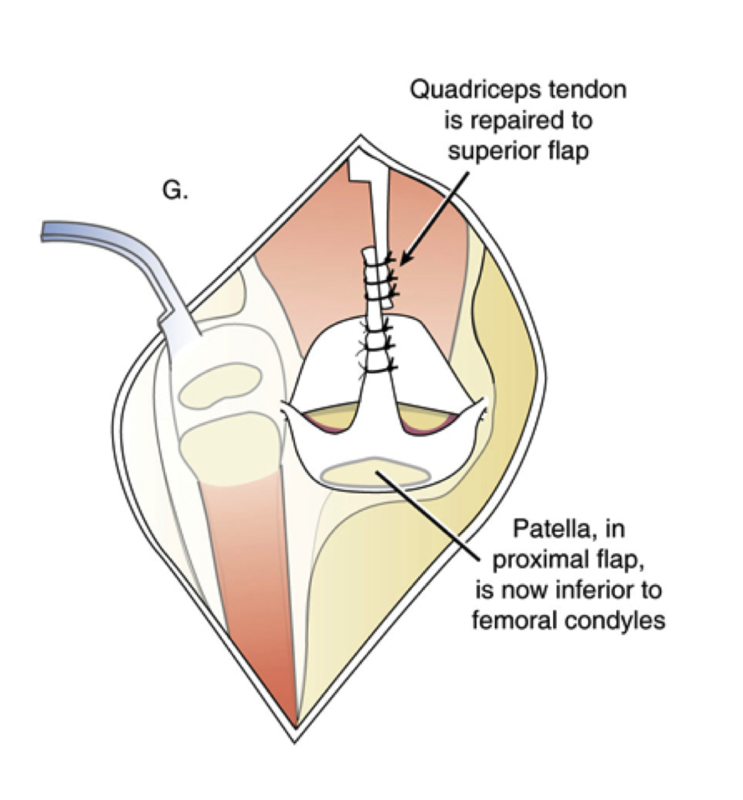 Dr. Paley then performs a Z-lengthening of the quadriceps tendon and sutures it to the superior flap. The patella has now moved downward into a better anatomical position. Next, the end of the proximal fibula is exposed and transferred just below the patella. The end of the fibular bone is cut and removed. The overlying patellar cartilage is removed and the patellar bone is exposed as well. 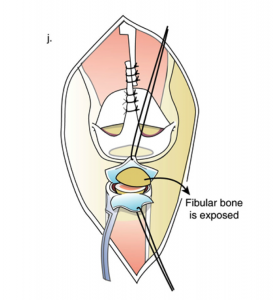 The two exposed bone ends (patella and fibula) are combined and sutured together. To ensure bone-to-bone healing, bone morphogenic protein (BMP) is inserted into the cartilage of the patella and the fibula. Since the knee and ankle were pre-distracted, they are both fixed by one wire across the knee joint. A circular external fixator is used as a holding device to ensure full knee extension and plantigrade foot. 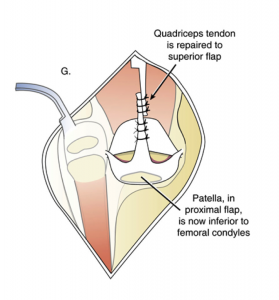 Dr. Paley will then reconstruct the knee joints using local tissues—the biceps tendon and semitendinosis. After three months, the external fixator is removed and the trans-knee wire shortened to span only the fibula and foot. After the fixator is removed, the patient is placed in a cast for one month. After that they are fitted for a KAFO brace. The brace is needed for many years until the knee is stable enough to allow walking without the brace. This usually will not occur until age ten. If there is no patella, but the fibula is autocentralized, then there is usually a quadriceps muscle present. The femur at the knee is usually less dysplastic in these cases. 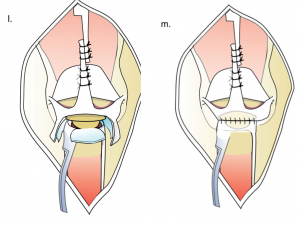 The knee still presents with a fixed flexion contracture and the foot, as in Type 5A, is dislocated and in extreme equinovarus (pointing inwards and downwards). The treatment is to distract the knee contracture until the fibula and femur are aligned with each other. The foot should also be distracted relative to the fibula to move it into the correct position. This is accomplished with an Ilizarov device on the femur and a circular external fixator at the foot. This permits simultaneous correction at both ends of the fibula. If the fibula is dislocated as in Type 5C, a TSF is needed for both knee and ankle and the correction is done sequentially. Once the distraction correction at both knee and ankle are completed, a second-stage surgery is performed to reconstruct the ligaments of the knee and to advance the quadriceps muscles onto the fibula. An ankle fusion is performed. All wires near the knee are removed in the office at least one week prior to this surgery. The external fixator is left in place for at least three months. Once removed, a spica cast is applied for one month followed by a hinged-knee ankle-foot orthosis (HKAFO) brace. 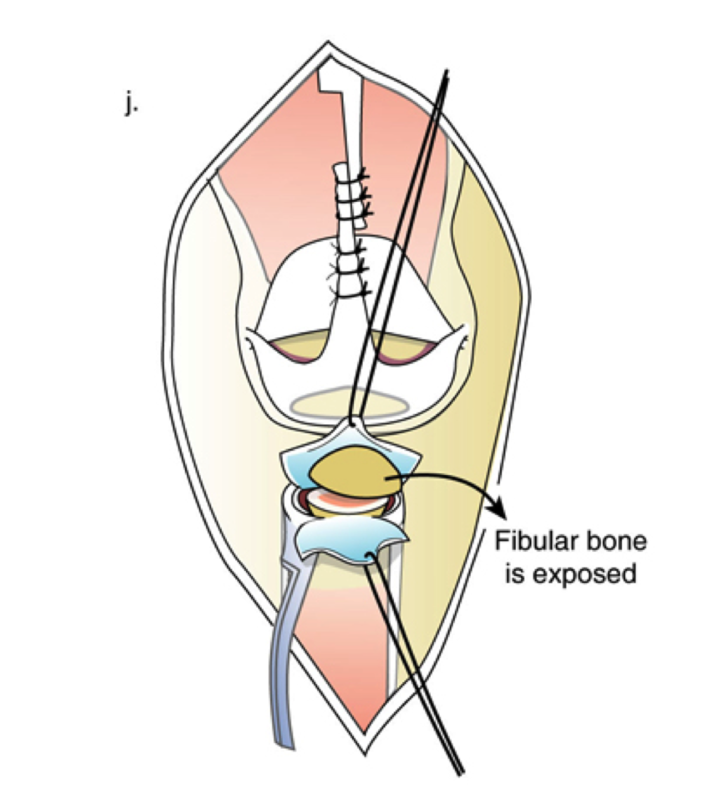 If there is no patella and the fibula is not autocentralized, the fibula can be centralized by distraction. First, Dr. Paley inserts a wire into the fibula that hooks over both ends of the bone, protecting them. An Achilles tendon tenotomy is then carried out. Two circular external fixator rings are applied to the femur (one at the femoral neck and one at the mid-femur). Another ring is applied to the foot with a wire inserted into the talus. The wire is inserted into the fibula and connected to the foot ring. This allows the fixator to distract the fibula at the knee and correct the knee flexion contracture. Once that is done, the fibular wire is connected to the knee ring and the fixator then distracts the fibula at the ankle. 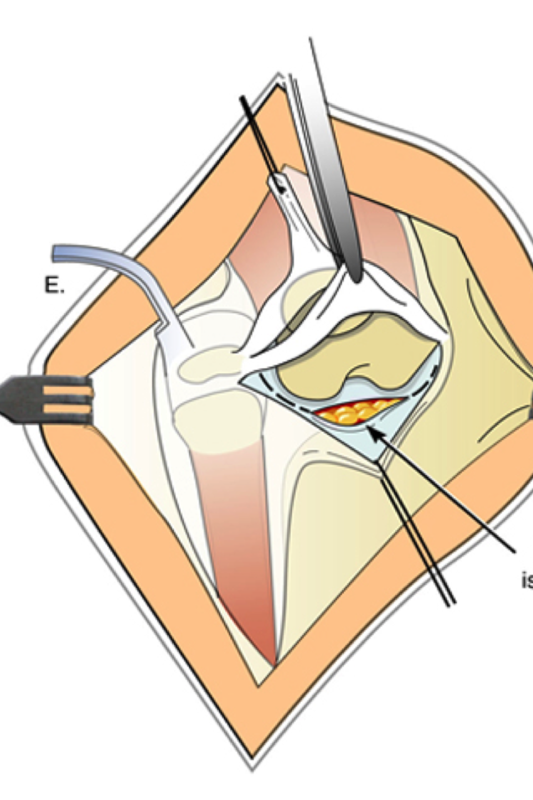 Once this is complete, the second-stage surgery can be performed. Dr. Paley begins the second surgery by exposing the fibula and femur at the knee. He then decompresses the peroneal nerve. He splits the biceps tendon and transfers part of it to the fibula to reconstruct the quadriceps muscle. The semitendinosis, the tensor fascia lata, the iliotibial band, and the adductor muscles are all transferred as well and connected together to the quadriceps. The transferred muscles are all connected together and attached to the front of the fibula to act as the patellar tendon. Before connecting the transferred muscle, Dr. Paley anchors the fibular head to the femur. This is accomplished through the creation of a new ligament that connects the femur to the fibula, using either an allograft or half of the biceps tendon. This step prevents dislocation of the fibula from the femur, one of the major pitfalls of the Brown procedure. The ankle is then fused. Dr. Paley inserts a wire from the foot through the fibula and then through the knee joint. The foot is immobilized in a plantigrade position and the knee in full extension. The external fixator is removed after three months, but the wire is left in place. A cast is worn for one month followed by a knee-ankle-foot orthosis (KAFO). The wire is removed after six months and knee rehabilitation commences. 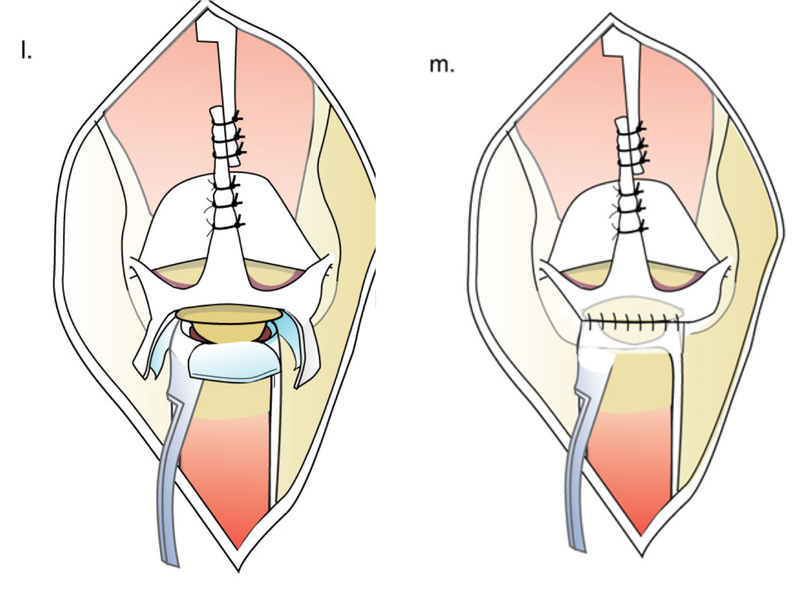 Other than amputation, the alternative to this type of TH would be a knee fusion. In unilateral cases, this is a reasonable alternative.